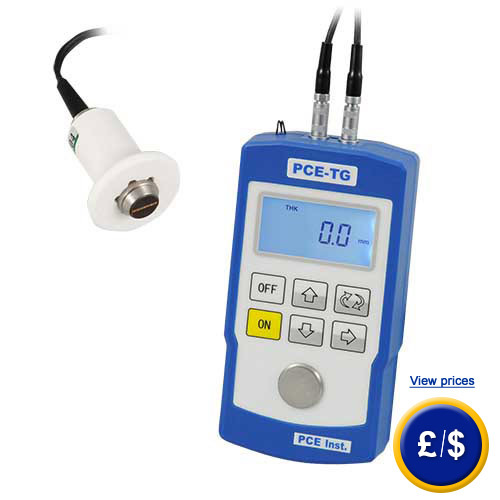 The PCE-TG110 thickness gauge can determine the thickness of metals, glass and homogeneous plastics in seconds. This thickness gauge is easy to use and takes highly accurate measurements of the thickness of walls and different materials. Each material requires a different velocity of sound. 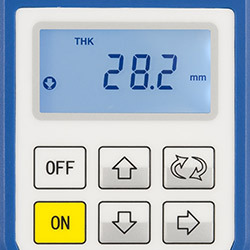 The thickness gauge comes adjusted from the factory with 5 different sound velocities for different materials. 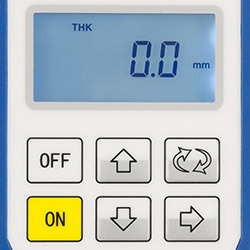 This thickness gauge can measure thickness of metals, glass, plastics as well as other homogeneous materials. 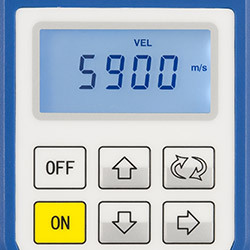 The sound velocity can be adjusted by the user so the thickness gauge can be set for use with a more diverse range of materials. The ultrasound sensor has a measurement head that can be placed inside an elastic black ring. This ring has sectioned circular cuts that allow measurement of straight, flat or circular surfaces. If measurements need to be taken in tight places, the screw for the sensor head adaptor can be removed easily so that the sensor can be used directly on the surface (diameter of 11mm). The thickness gauge comes calibrated. An optional laboratory ISO calibration with certificate can be ordered.If you have further questions about the Thickness Gauge, look at the following technical information, read the technical data or get in contact with us: UK customers +44(0) 23 809 870 30 / US customers +1-410-387-7703. 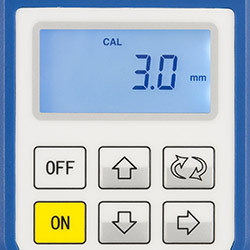 Our technicians and engineers will inform you about our Thickness Gauge or any other product in the field of Regulation and Control, Measuring Instruments or Scales and Balances of PCE Instruments Ltd.
0 ... +40 °C / 20 ... 90 % r.h.
For companies that wish to include the thickness gauge as one of their internal tools or for annual recalibrations. The ISO certification includes a laboratory calibration and a document with all the measurement values. The standard kit includes a tube of coupling gel. If you are aware that you have to perform many measurements you can order more gel from us. We recommend that you use the coupling gel to improve the contact between the sensor head and the object that is measured and to protect the surface of the object from the sensor.